Stores reference 5C/2728. The correct 2-piece 'torch' for the 1941 pattern Mae West. The cylindrical metal battery container has virtually all of the original deep blue paint finish. It has clear King's crown Air Ministry and reference marks. 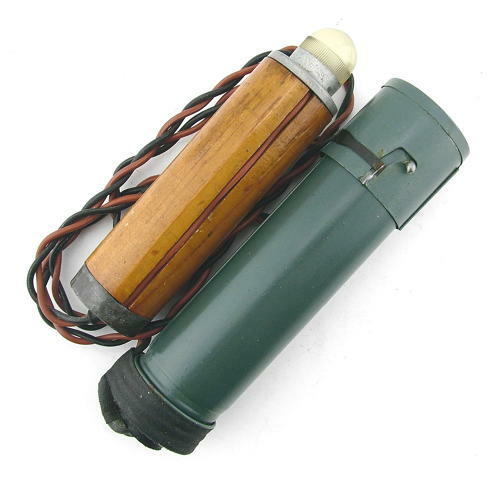 The wooden floating section is equally good and retains both bulb and clear domed cover. Unusually, the wiring is in super flexible condition with no cracking, perishing or loss of the rubber covering. Excellent, probably unused condition. Stock code MW22750.